May is quite a busy month. Not only is the week of May 16th-22nd American Craft Beer Week but May is also National Hamburger Month. This seemed like the perfect chance for my pal Burger Beast and myself to team up and create a great event. We talked to The Filling Station and made the event a reality. The event will be taking place Wednesday, May 18th. We put together some great comfort food with some excellent and rare beers. This will be one of your only chances to try the one-time-only beer from Dogfish Head, Hellhound On My Ale. This special beer was made for blues legend Robert Johnson's 100th birthday. Seating will be limited so call or email now and reserve yourself a spot, as they will fill up quickly. 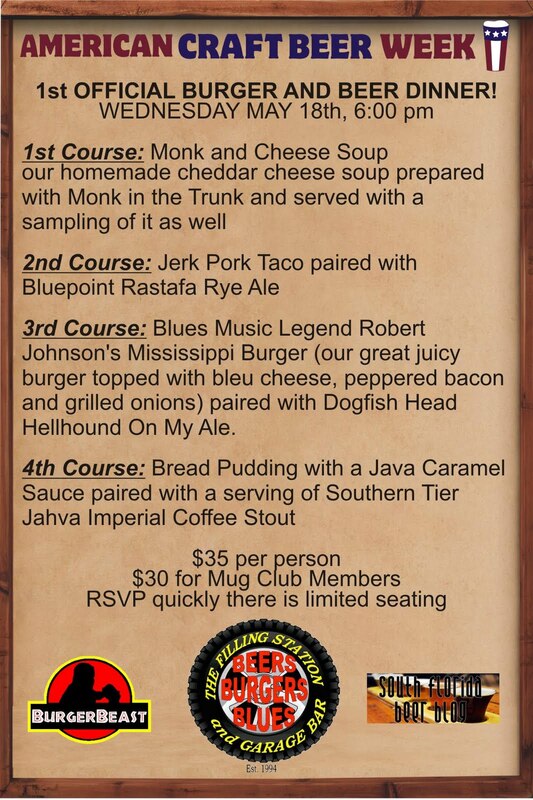 Check out the menu and I hope to see you there. 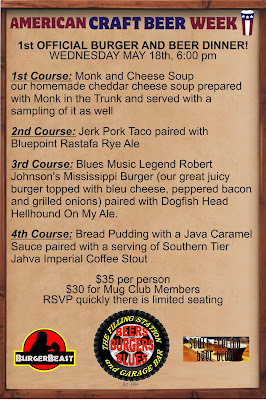 3rd Course- Blues Music Legend Robert Johnson's Mississippi Burger- our great juicy burger topped with bleu cheese, peppered bacon and grilled onions paired with the one time only brew from Dogfish Head, Hellhound On My Ale...you don't want to miss this beer. 4th Course- Bread Pudding- with a Java Caramel Sauce paired with a serving of Southern Tier's Jahva Imperial Coffee Stout. Wow... That meal sounds like a great time and an amazing bargain. Is it open to the public? When do you have to RSVP? Open to everyone. RSVP ASAP before it sells out.